And he is absolutely right. The CHA, specifically "Sister" Keehan, are very wrong to mislead Catholics into voting for a bill that will greatly expand and fund abortion. The Archbishop of Kansas City has urged Catholics to contact key members of Congress and ask them to vote against the Senate health care reform bill. He also expressed his disappointment with the Catholic Health Association for its apparent willingness to accept government-funded abortion as part of health care reform. Writing in The Leaven, Archbishop Joseph F. Naumann noted specific problems with the health care bill. Its $7 billion appropriations for Community Health Centers can be used directly for elective abortions. It uses federal funds to subsidize health care plans that cover abortions, thus making abortions more accessible. The bill also uses the power of the federal government to force people to pay for other people’s abortions even if they are morally opposed to it, the archbishop wrote. 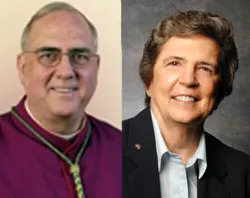 Archbishop Naumann said he was “deeply troubled” to learn that Sr. Carol Keehan, the Chief Executive for the Catholic Health Association (CHA), has urged the U.S. House of Representatives to vote for the Senate health care reform bill. CONTACT YOUR REPRESENTATIVES and SENATORS! !